TCCL publish handbooks on best management practices (BMPs), soil fertility management and yield intensification. TCCL’s resources include a catalogued library. Based on 30 years of field experience, TCCL provides practical advice on plantation and smallholder management, diagnosis of field problems, and best agronomic practices to improve productivity and efficiency. We work in all geographic regions where oil palm is grown (Southeast Asia, Africa, South and Central America). TCCL harnesses computer technology to improve agriculture. For example, TCCL developed the Fertilizer Chooser App, a tool for sourcing the least costly combination of nutrients to implement a fertilizer recommendation. 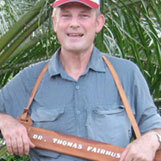 Thomas Fairhurst developed the technique of using best management practices in oil palm for yield intensification. The technique has been proved to be a very effective tool with a track record of success with yield intensification in plantations and smallholdings in Southeast Asia, Africa and Central and South America. Environmental stewardship is integrated in all our field work and publications. We recognize that optimizing yield and profitability with efficient use of external inputs is the key to sustainable production. Driving knowledge into the business is key to increasing yields, profitability and achieving sustainability. Research and development are required to develop BMPs. TCCL was set up by Thomas Fairhurst in 2008 to provide consultancy services in tropical crop agronomy and management. The overall focus of the consultancy service is to assist clients with ecological and sustainable crop intensification in lowland, upland and plantation agriculture systems. Draft animals for in-field crop collection?